A decadently smooth and creamy shrimp bisque filled with chunks of succulent shrimp. You have probably noticed that I am a bit of a shrimp fanatic and I am constantly on the lookout for new ways to enjoy shrimp. A while ago I came across a recipe for shrimp bisque on Kalofagas (originally from the Toronto Star by Marion Kane) that sounded like it might just be the ultimate shrimp dish. This soup uses shrimp in no less than 4 different ways. The shells are simmered in the broth to release their flavour, the body of the soup contains pureed shrimp, chopped shrimp and whole shrimp for garnish. I looked at a few recipes for shrimp bisque and I ended up choosing this one because I like the fact that the shrimp were sauteed in butter and then the pan was deglazed with wine to pick up the extra shrimp flavour. The recipe looks a bit long but don’t let that intimidate you as the results are well worth he effort! The shrimp bisque was amazing! It was nice and thick and rich and creamy and full of shrimp flavour. I really enjoyed the texture that the pureed shrimp added to the soup and the every spoonful was filled with juicy succulent chunks of shrimp that were burst in your mouth good. Heat the oil and melt the butter in a large sauce pan over medium heat, add the onion, carrots and celery and saute until tender, about 10-15 minutes. Add the garlic and shrimp shells and cook for 2 minutes. Add the stock, water, tomatoes, sherry, brandy, thyme and bay leaf, bring to a boil, reduce the heat and simmer, covered, for 30 minutes. Strain the liquid into another sauce pan and discard the solids. Add the rice, tomato paste and paprika, bring to a boil, reduce the heat and simmer, covered, until the rice is cooked, about 20-30 minutes. Melt the butter in a pan over medium heat, add the shrimp and saute until just cooked, about 2-3 minutes per side. Add half of the shrimp and the juices to the soup and puree until smooth with an immersion blender or in a food processor or blender. Add the remaining shrimp, sherry, brandy and cream and heat to serve. It’s a family favourite and it’s no surprise that you loved it so much. Thanks for trying yet another one of my dishes and thanks again Marion. Looks incredible and will be perfect on a cold and rainy day!! WoW, that looks fantastic! I am hungry now. And hungry for shrimp no less. That is going to be a must try for me. Thanks Kevin & Peter. Wow, that looks good! But, then I’m not surprised based on where you found the recipe. This looks amazing, I am also a big fan of shrimp! I love shrimp too! The bisque looks delicious and really flavourful. Beautiful, just look at that color! This looks and sounds divine. what i mean is I dig this enough to want to make it. I just sent this to my dad – he will definitely make this! Wow! That looks incredible, and the color is so pretty! Wow Kevin! That looks fabulous! I must try this..it looks really good and I love shrimp. Perfect for the cold weather and looks so amazing. I love shrimps too! A beautiful dish! That looks so decadent! yum! just saw a recipe for shrimp bisque in serious eats today! SB must be in the air. i dare say yours looked better 😉 can’t wait to try this recipe! this really look good!1 I’m a shrimplover!! With a list of ingredients that long, this has to be great!!! Beautiful color and I bet a very intense flavor!!! Looks like we all went “unda tha sea” yesterday…I posted a crab curry!!! I love this, but i have to admit, i have never made at home, always bought from the counter in the fish shopw here. Kevin you have got to stop! I am starting to dream of your food and not only at night. I adore shrimp and this looks and sounds fantastic! But sadly I have no luck either finding or ordering at any fishmonger fresh shrimp in Nantes. I guess I will have to start begging at restaurants. I am a shrimp lover myself…Nice. This looks and sounds amazing! Adding rice and to puree it is something new….perfect bisque! this looks great! I especially like the double addition of sherry and brandy — that’s my kind of cooking! I have been looking for a good shrimp bisque recipe! This one looks like a winner. I’m a shrimp fanatic too. You are amazing! I absolutely love this! okay. I am in love with how this looks! I am so curious if it tastes as wonderful. A very pleasing mix! I love the color of your bisque! Looks amazing! That looks fantastic…another recipe keeper! If I could order this for lunch today – I would be tickled pink! Delicious looking bisque! And, there’s not as much cream in the recipe as I thought there would be. Looks great! Wow, Kevin. This looks amazing. 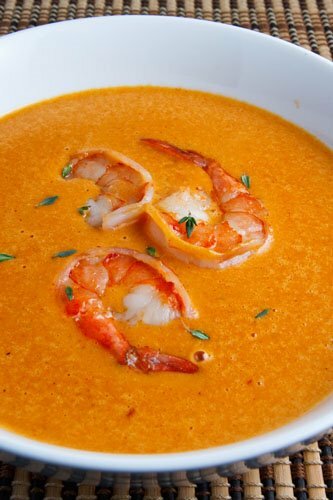 I love lobster bisque and I love shrimp, so I bet shrimp bisque would be amazing! Kevin, that sounds delicious and beautiful to boot! Wow, Kevin! How did you get such a great color? I have not made a bisque before. I think it is about time. Kevin, you use dashi for this? that’s so clever. I use dashi sparingly, never thought of using it for the bisque. It’s delicious, of course! I love the bright color of the soup,and the shrimp look very inviting. The sweetness of seafood makes them perfect for this. Crab and lobster are good too. Yours has great color, especially with those shrimp on top! Not a shrimp eater, but I have this on file to make for the many people I love that are! What a gorgeous color and those shrimp on top look like they’ve been cooked to perfection! Sounds delicious! Lobster Bisque is my absolute favorite—I’ll have to give this Shrimp Bisque a try! I love a good bisque, and I’m not surprised that it originates with Peter. Yours is beautiful. I had shrimp bisque at one of our local restaurants, it was so rich and creamy and I loved it. Yours Kevin looks equally as good if not more so. Will have to give this recipe a try as both my DH and I are seafood lovers. I am a shrimp lover & That is one great dish with all shrimp in it. Look at that color! that lools mouthwateringly good…the recipe sounds like it’s packed with flavor … nice job! I’ve been wanting to try a bisque – they look so rich and yummy. What a beautiful soup! This is quite different from other shrimp bisque recipes I’ve made. Nice colour Kevin! You certainly don’t shy away from the the recipes with lots of ingredients. I would love to see the inside of your cupboards. Absolutely fab: can’t wait to try this! that shrimp bisque looks so pretty! u mentioned somethin bout using the shells of the prawns as the base of the soup? that sounded like wht we have over here , its called Hokkien Mee. Breadcrumbs to coat the fish and the actual sauce/gravy is the melted butter and crushed garlic. and before u serve it squeeze some good amount of lemon juice and its good to go! Mmmm … yum! I love soup, and I’m not put off at all by the recipe. It’s gorgeous! I will serve this the next time we have guest! New to me..still drools kevin. Amazing looking soup. I’ll try this sometime, but right now I’ve eaten enough soup to float a ship. 🙂 Thank goodness I am now onto the soft foods diet. I'm going to try this one out & thought you might like it…Roasted Shrimp & Broccoli: http://www.theamateurgourmet.com/2009/02/roasted_shrimp.html. Love your blog. The photography is beautiful (love food photos) and the recipes are fabulous-looking…too good…makes me hungry! Ow, that looks amazing! I love shrimp. I am a huge shrimp fan myself. This looks wonderful and I know my husband would also love it. This looks superb! The colour of the bisque is so rich. this looks so good! I love shrimps aand all those lovely ingredients, mouth watering! This looks absolutely phenomenal. I can’t wait to try it. You are at the top of your game! I am currently eating this and I added a bit of cayenne powder when I cooked the shrimp. My only comment is that it needs a little parsley but is so tasty. I haven’t tried the recipe yet, but I have no doubt that it is good: Back in the early ’90’s I had a little seafood restaurant on the New Jersey shore (Beach Haven), and it always annoyed me when I had to discard the shells from shrimp I peeled for other dishes. I came up with a bisque that used the flavor from simmering the shells, at the rate of a gallon of water to the shells from 5 pounds of shrimp. The flavor was so intense that no additional shrimp was needed, except for texture and as a garnish. To keep the dish a bit more healthful, I would let the broth cool and then add powdered milk and butter, rather than cream. Don’t turn up your nose until you try it. My customers raved about it and had no idea that, in a way, it was flavored with garbage! I just came across your blog, I like it a lot. I am a food blogger myself, with only few months blogging. Anyway, this soup looks amazing! I can't wait to try it! Is there suppose to be duplicates in the ingredients? Such as dry sherry and brandy. I'm assuming since they are duplicates, we don't need to duplicate? Just wanted to double check. Anonymous: There are no duplicates in the recipe. Any ingredient that is in the recipe twice is used in two different locations in the recipe. I like to list the ingredients in the order that you get to them in the recipe so that you can go down through them one at a time as you follow the instructions. "Add half of the shrimp and the juices to the soup and puree until smooth." I am stuck here. When you say puree it, do I have to put it in a processor to do so? BTW great recipe. Carla: You can puree them in a food processor or blender or even use an immersion blender right in the pot. I updated the recipe to indicate that. Enjoy! WOW! Absolutely delicious! I am so grateful I found this recipe…..I'll be making it quite frequently!!! Stacy M: I also recommend the clam juice!